To see clearly and well for a lifetime, your eyes need specialized care. That’s why the experienced eye doctors at Kato + Shoji Optometrists in Honolulu, HI, provide the high-quality range of optometry services you can rely on. Whether you’re coping with glaucoma or need a routine eye exam, these experts are there to help. Kato + Shoji Optometrists offers an array of eye care services including exams, contact lenses, prescription glasses, and Lasik eye surgery. The team also provides in-depth, specialized care to treat and manage a range of eye conditions including cataracts, glaucoma, and macular degeneration. Whether these friendly professionals are helping you choose the perfect pair of frames or are giving you tips on at-home care, this practice strives to help every patient live well. By staying on top of your eye health today, the doctors will help you see more clearly and live more comfortably later on. This practice consistently stays current with the latest advancements in eye care, lenses, and vision technology so as to provide patients with the highest quality of service. These eye doctors not only take your vision seriously but they also strongly value your overall wellbeing. That means they will take the time to listen to your unique needs, answer your questions, and help you feel comfortable and respected. By maintaining a friendly, relaxed environment, these doctors believe that everyone benefits. 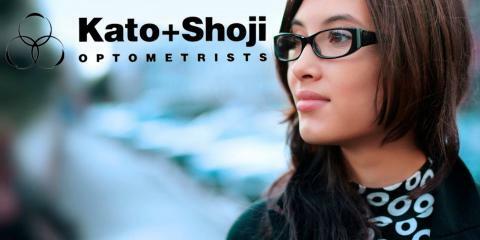 If you’re interested in personalized, quality eye care, enlist the top optometrists from Kato + Shoji Optometrists. To schedule an appointment, call today at (808) 735-8080 or visit the website.